Bosch Rexroth's IndraControl L20 mini-programmable logic controller was proposed for the project. The company's series ED05-DDL digital control process controller. The Valve Terminal System, Series LP04, was part of the resulting design solution. Life on an oil rig, whether it's in the treacherous waters of the North Sea or in the tropical climes of the Indian Ocean, is full of risks at the best of times. For oil riggers, working on and around the well are some of the most dangerous of jobs. While drilling into the sea bed, the bore hole may pass through several different strata, each layer having its own particular characteristics. If the well is not cemented correctly, then the contents of the various layers can mix and cause problems with the well, resulting in expensive downtime. Two diesel engine driven pumps, situated in the cement room in the bowels of the rig, are used to push the cement down the well. After the cement has hardened properly, it is drilled through and deeper drilling of the well recommences. Because of the low pressures involved, the operator can control the pumps manually in relative safety. The two pumps are suitable for a variety of other pumping operations, such as pushing chemicals into the bore hole to permeate the formation and thereby enhance recovery. Again, since the pressures are relatively low, the operator can control the diesel engine driven pumps from the local position at the engines. For high pressure testing operations, the same two pumps are used to force water into the bore hole to test the well. These operations are more hazardous and require the pump operator to stand in a place of safety, away from the cement room. Under these circumstances, a remote control system is necessary. Oil and gas equipment manufacturer Aberdeen Control Limited specialises in the manufacture and provisions of hazardous area equipment for these kinds of jobs in the offshore oil, gas and petrochemical industries. The company makes control equipment and supplies specialist materials and installation and back-up services around the world. One particular piece of equipment that Aberdeen Control manufactures is a control cabinet designed to allow remote control of these diesel engine driven pumps. When Aberdeen Control received an enquiry to build nine control systems for use on offshore oil rigs, an alternative design was requested and explored. Previously, the client, Schlumberger, had used an electro-pneumatic fully-remote control system which was adequate but did not provide a fine enough control for some functions. Aberdeen control managing director Graeme Craig liaised with Bosch Rexroth to assess if this type of remote control system could be achieved. Rexroth offers software tools that can integrate mechanical, electrical and pneumatic components in a design. It proposed using a programmable logic controller (PLC) to control the DDL field bus LP04 manifold to ensure that the hazardous zone certification requirements were met. In addition to providing a cost-effective solution, the expectation of using PLC-based solution was to achieve finer control of the system. On the recommendation of Aberdeen Control, Schlumberger agreed that Rexroth's components and technical assistance would produce a practical solution. The technical aspects of implementing a PLC-based control system into the design were examined with the Aberdeen Control project team at a subsequent onsite meeting. “Rexroth responded well to the oil field lead times,” said Craig. The project deadline was very short, with the first cabinet being required only four weeks after the initial meeting. Parts had to be supplied quickly, with software written and tested in approximately 10 days. “This, in my opinion, was a critical factor for the rapid and successful completion of the project,” he added. The resulting design solution included Rexroth's LP04 double 3/2 version valve manifold with integrated DLL field bus and RA14 3/2 valves. 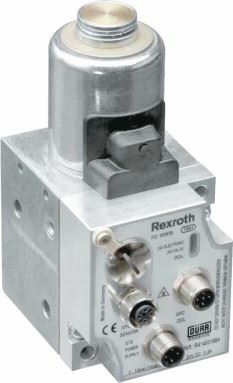 For the safe area version, Rexroth's ED05 pressure regulator and DDL and ED05 sub-base were specified, along with filter assemblies, mounting kit and DDL units and ancillary components. The ED05 products were swapped for ED07 products for the ex-rated system. 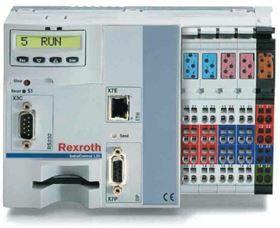 On the control side, Rexroth's mini-PLC, the IndraControl L20, with IndraLogic firmware, was used. The customised program was developed by Rexroth's application engineers using the system tool IndraWorks with WinStudio lite runtime and editor. Before shipment to the oilrigs, the modified control systems were bench tested and then connected to a diesel engine driven pump for full cycling tests. The modified control system ensures that these control cabinets can now be supplied by the client throughout the world for similar applications, and are already installed and operational on two oil rigs – Rowan Gorilla VI and Leiv Eriksson. “Overall this project was very challenging,” said Craig. “In the end it worked out rather well and both Schlumberger and Aberdeen Control have been pleased with the technical design.” Following the successful completion of the first two installations, more of these control systems are planned throughout 2008. In addition, future project work with Aberdeen Control and Schlumberger is anticipated. Bearing and seal supplier, SKF, has introduced its Electric Cartridge Pump ECP, developed to lubricate bearings and linear guides in small machines.